Halloween means it’s time to hit the road in search of some spooky spots. If you’re looking for some inspiration around Pennsylvania, just check out one of these regional spots known for some paranormal and supernatural occurrences. Opened in 1829, this imposing building was built in the Gothic style and became the first prison in the United States to implement solitary confinement. The prisoners sat in stone cells with no human contact, and even had bags placed over their heads when they were transferred about. At the time, solitary confinement was touted as a method of rehabilitation, though it certainly wasn’t without its critics. The prison closed in 1971 and since then there have been a number of explainable incidents in the abandoned wards. Those who visit it claim to have heard eerie whispering in the cell blocks and have even seen full-blown apparitions roaming the corridors. Opened to patients in 1864, it was designed by renowned architect Richard Andrews to maximize exposure to sunlight and fresh air, which it was believed would help to create a healing environment for those who were committed there. However, by the 1950s, the facility was overloaded with patients; designed to house 250, it was stuffed with nearly 2,400 people living in abysmal conditions. With too little staff to comfortably manage all the people there, things got out of hand, especially with the afflictions of those living there exacerbating the problem. From alcoholics to epileptics, the staff resorted to physical restraint and inhumane treatments to keep patients in line, including electroshock and lobotomies. Due to the horrendous conditions, the facility was forced to close down in 1994 with a new wave of mental health reforms causing it to be unfit for patients. Hundreds, maybe even thousands, of patients died in the asylum over its long history, and this, along with the building’s gloomy history, has inspired a fair share of ghost stories and even purported sightings of shadowy figures. 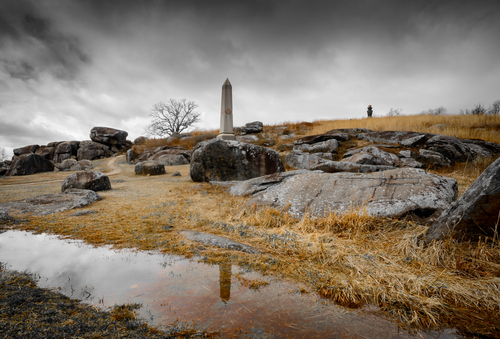 Gettysburg was one of the Civil War’s most famous battles certainly, but also one of its bloodiest. Over the course of just a few days, more than 50,000 men were killed or wounded. Raging from July 1-3, 1863, the battle is viewed as the turning point of the war. With so much bloodshed in one place, it’s no surprise that there are spooky happenings taking place even 140 years later. There’s a farm that served as a field hospital during the battle that is supposedly haunted by over 10,000 deceased soldiers. There’s also an inn nearby that has some strange happenings that regularly occur. The battlefield itself is also haunted, with ghostly figures sighted along the treelines. RVs encourage you to travel more often, and with so many affordable RVs at Fretz RV, you can travel more affordably too. Find us online or stop in and see us at Fretz RV in Souderton, Pennsylvania, today before you set out on any spooky trips this fall.